Whether you’re looking to freshen up a drab kitchen interior or aiming to sell a home on the market, it can be difficult to choose the right cabinet finish. A cabinet finish that coordinates with the rest of the desired kitchen elements and appliances in a tasteful way will help you see the best return on your investment. Homeowners may choose manufactured wood doors and drawer fronts that are unfinished. This may first appear to be a less expensive choice, but the costs will accrue when homeowners prep and paint them. Any preliminary savings are lost. Keep in mind that any hand painted kitchen requires a coat of acrylic lacquer for protection. Wood is a versatile option for homeowners. It has a broad appeal and is a classic option. For those looking to eventually sell a home, wood makes a timeless choice. 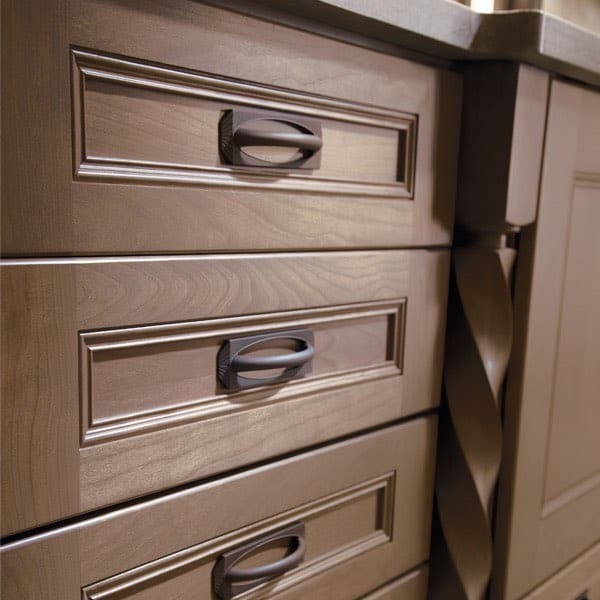 We craft cabinets from many different types of wood. Take a deeper look here. Paint is heavily pigmented. The underlying wood will not show through. White, cream and eggshell colors are popular. Eggshell is a warm finish that reflects light well and can be easily cleaned. A glaze is semi-transparent application available to apply over paints. Glazes help provide depth to the cabinetry. Homeowners benefit from more contrast but less consistency. Any details and crevices will be highlighted with a glaze application. When homeowners select an antiqued patina, they are looking for cabinetry that exudes the appearance of wear over time. These patinas are hand-rubbed and as such each cabinet door or drawer will be unique. Those looking for a more rustic look may consider this type of cabinet finish. There are a variety of techniques available for homeowners that choose to distress their cabinetry. The wood’s surface will be scored and give the appearance of age and a more weathered patina.